A slightly smaller Staff Picks this week as we go without a guest submission. We have had plenty sent in, but they have only contained a very brief description (usually a sentence or two) about why the the user actually enjoy the mod and what it does. I will post these up in the next few weeks, though probably in a large group. If you are submitting a mod for this feature, please try and include some details as to what makes it special to you and what the mod actually does - a bit like we have below. For us, SirSalami has this week been back in the world of 'The Witcher 3' trying out a combat focused mod, Terrorfox1234 has been chatting to crabs and I have lost my sense of immersion for a more in your face health bar system. We love to hear your selections, so if you have a mod you would like to submit to the community (not your own), please check out this new and handy form. Please fill it out completely and ensure that you add some details about the mod and why you have chosen it (similar to how we have below). Just remember that other mods on the site may do roughly the same thing, so keep your eyes peeled and understand that these are just our personal picks. That said, hopefully, you'll find something you may not have seen before. Who knows, maybe we'll even learn a little about each other along the way. Though I personally like The Witcher 3's combat a lot, as they say, "there's always room for improvement". This is especially true for us modders. This one aims to give players more precise control over Geralt's acrobatic sword attacks, as well as sign/spell usage. By default, when initializing an attack close to an enemy, the game will automatically make Geralt advance with a predetermined animation. Even without using the game's lock-on system, Geralt tends to focus on only one particular enemy at a time. 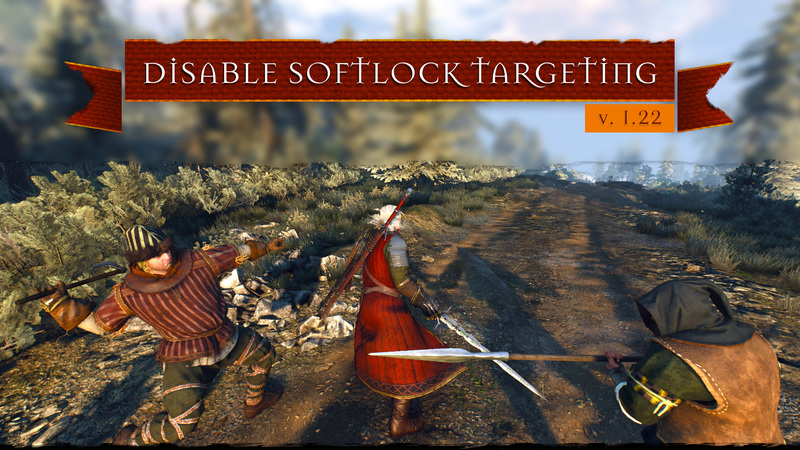 By installing this mod and disabling this "SoftLock" however, your character will no longer automatically advance toward a fixed target when attacking. Instead, depending specifically on your movement input, Geralt will initiate specific attacks in the precise direction of your choosing. This can lead to both embarrassing whiffs, as well as satisfying combos and multi-hits, depending on skill. The difference is akin to comparing the fluid and accessible combat featured in the Batman Arkham series and the precise and demanding combat of Dark Souls, with vanilla being the former and this mod providing the latter. This video from the original author explains these changes quite well: https://www.youtube.com/watch?v=mJ1959hkgMQ. So not only does this mod enhance your control over the character but it can also force you to be more deliberate with your actions, which I feel ultimately leads to a more rewarding combat experience. Originally created by FoxHoundSWE, the latest release from Sunkid supports v1.22 and v1.31 of the Witcher 3. Great work! Mihail has been churning out some high-quality beasts and creatures lately ranging from massive dwarven automatons to normal-sized sewer rats. This latest effort though is something else entirely. Seriously. Look at that cute little guy. He talks. He sells things. He buys things. He carries those things on his back. Those of you that played Morrowind may remember the original mudcrab merchant. Bringing this little crustacean into Skyrim may entice feelings of nostalgia and brand-new excitement. Dressed up mudcrabs have that effect. I’m not sure what else there is to say. It’s a mudcrab merchant, and that is a wonderful thing. There is many an occasion when I would like to be totally immersed within my game, the HUD off and it being just me and the world around me, other times I quite like the sense of knowing what exactly is going on despite the fact it means my screen is covered with icons, maps, suggestions and whatever else the developer has thrown in for good measure. So after coming direct from a few evenings of playing Guild Wars 2 (Yes, I'm still going), I decided to try out this mod and have actually come to love the fact I can see exactly what is going on at any particular point. The enemies are now very easy to distinguish but also easy to see who to target first. 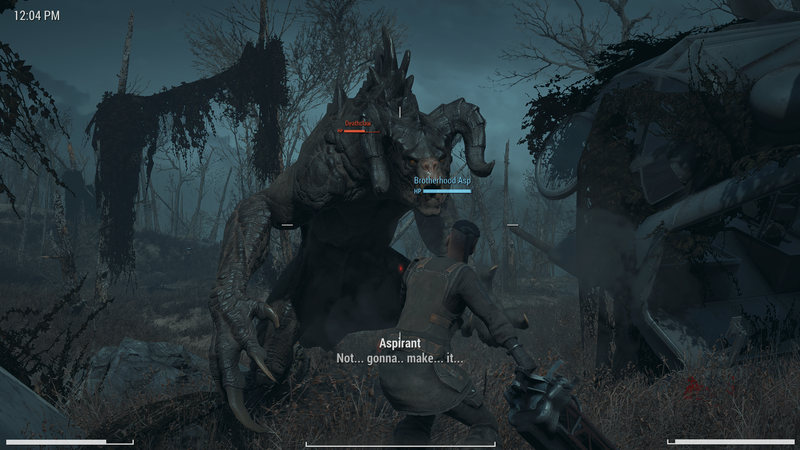 My companion's health is also visible, which is nice as it allows me to see how much of a battering MacCready is taking for me. As with any good mod, it is highly configurable, from the colour of the various bars, to whether you would like it enabled or disabled for a particular type of NPC and even the scale. If you don't mind your immersion in the game being a little less than usual, then I would recommend giving it a whirl. It really is quite helpful. 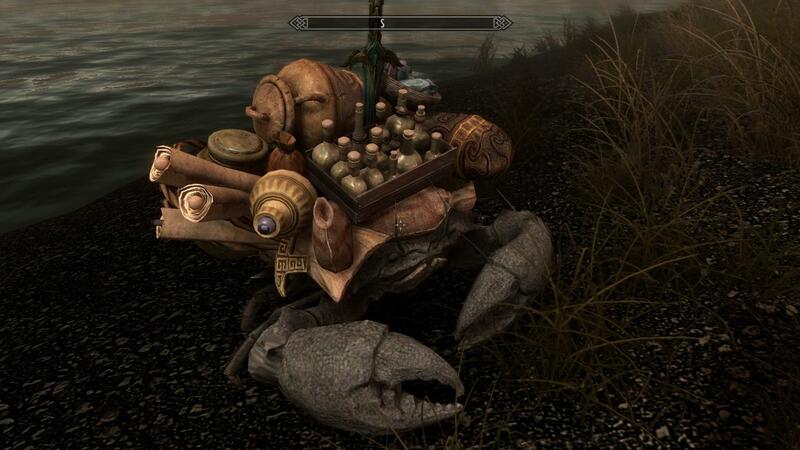 Oooh, I'd love to see the Mudcrab Merchant in SSE!!!!! Pretty good, I think it should be more abundant. Thank.